If you’ve never heard of the Universal Declaration of Human Rights, you aren’t alone. Meredith Stern’s prints, currently on display in the Special Collections Research Center of Hatcher Graduate library, are meant to raise awareness of the document and commemorate its 75th anniversary. The exhibition will continue through February 1, 2019. In 1948, in the aftermath of World War II, the United Nations General Assembly adopted a document, called the Universal Declaration of Human Rights, meant to define the rights that every person is entitled to – rights known as human rights. These include rights such as equality, freedom of religion, and access to food and shelter. There are thirty rights total outlined in the document. Largely the result of the efforts of former first lady and U.N. ambassador Eleanor Roosevelt, the document’s purpose was to prevent egregious transgressions against humanity as occurred during World War II. You can read the full document here. The issue with the Universal Declaration of Human Rights is that is isn’t law. Just read the news, and it becomes obvious that there are people whose human rights are violated on a daily basis. 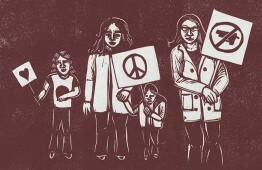 Visit the exhibition Universal Declaration of Human Rights: Linocuts by Meredith Stern to enjoy some art and increase your awareness of human rights. Each of the prints illustrates one article of the Universal Declaration of Human Rights, and there are a total of 14 on display. The exhibition is free and open to all. The Special Collections Research Center is on the sixth floor of Hatcher Graduate Library, and it open from 9am to 5pm on weekdays.